I thought that was a very elegant truth when I read it a couple of weeks ago, and fought the urge to write at length in support of the simple statement. With the release of Ontario's feed-in tariff (FIT) review last week, celebrating 10700MW of renewables to be operational by 2015, I was more tempted to produce volumes illustrating the simple truth, and when I read Tom Adams' "The affliction for consumers is not a surplus of baseload generation but a surplus of take-or-pay generation, some of it stupidly expensive," I started pulling data and formatting graphs. The term load is meant as the power consumed. Generation must meet the consumption, so it is reasonable to view all the various generators as supply, and the demand as load. 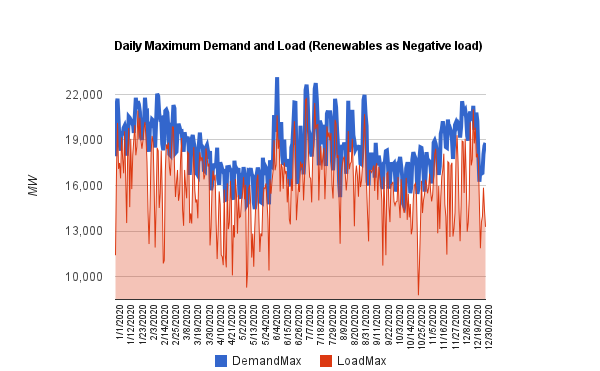 Wind and solar contracted on a 'must take' basis, which the FIT contracts are, isn't meeting demand, but it is changing the load that must be met by other generators. Baseload therefore refers, initially, to demand. The first graph shows baseload as the minimum daily Ontario demand. Between 2005, and 2011, the minimum dropped -on average 1574MW. That, coincidentally, is about the capacity of nuclear supply due to return as Bruce 1 and 2 return to service (I think the contracts were negotiated in 2005). 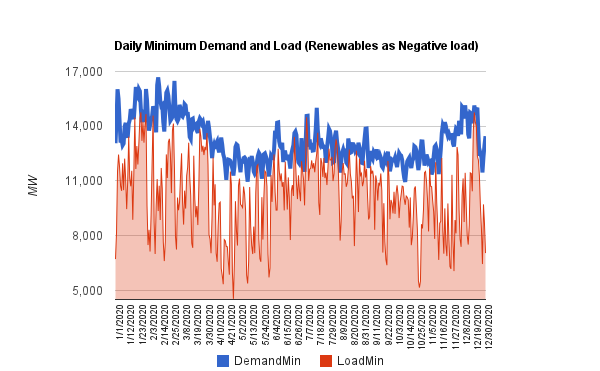 Baseload supply generally refers to supply that is to meet this minimum demand - which would be the base load. It is usually expensive to build, and cheap to run; that means nuclear, but it can also mean hydro, combined cycle gas generators (CCGT), theoretically with carbon capture - the same for coal plants, etc. In general the characteristics are large capital costs and lower operating costs (MIT recently published this on the impact on existing generators from increasing renewables). Baseload supply did serve to reduce the amount of peaking, or intermediate, supply that the remainder of the generation mix needs to meet demand. 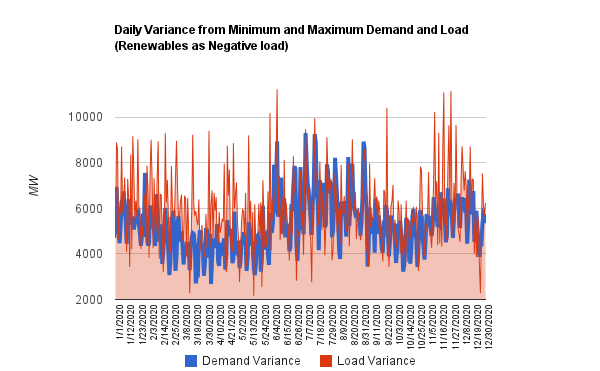 Wind especially, but also solar, do the opposite - they increase the daily swings in demand. To the rest of the generators, there are not only more accurately in the 'load' equation, they are the least predictable factors in that equation. 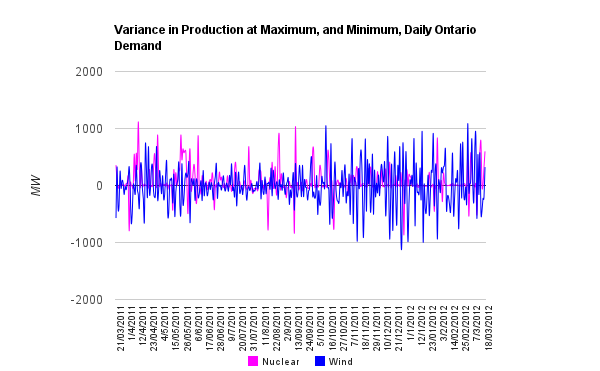 In Ontario, baseload supply was approximately: 2500MW of hydro (varied by season), 11000MW of nuclear - which was about right in 2005, and a number of natural gas (primarily) generators were contracted on a 'must take' basis, adding another 1000MW. Nuclear generator availability not being 100%, this was appropriate until demand drops accelerated. 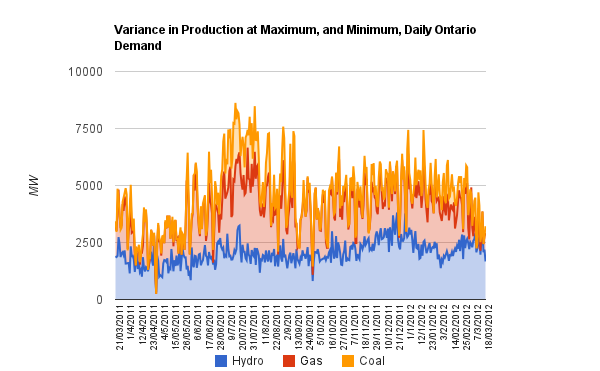 Until the deep recession of 2009, exports hid the excess capacity, but since then the term "surplus baseload generation' (SBG) entered Ontario's vocabulary. 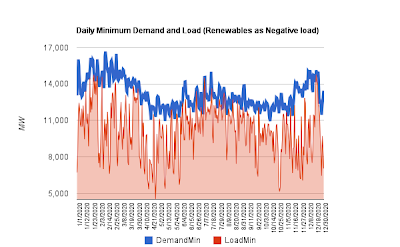 This leaves sources for matching demand above the minimum (non-baseload). 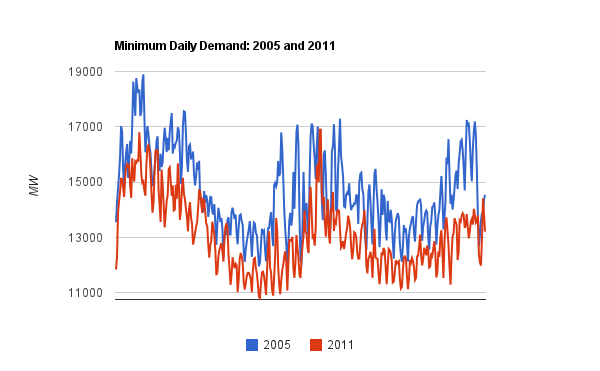 For the same time period, the actual differences between production at the day's minimum demand, and at the maximum, is charted. When the FIT review noted we were on track to achieve 10700MW of renewables supply by 2015, it also noted coal would be eliminated by then - note the variability of hydro and gas rarely exceeds 5000MW, and doesn't exceed 7000MW on any day. I've gone back to the data set I built for an earlier series of posts, adding wind capacity to set wind at 8100MW, and I've also grabbed a sample data set for solar production in London, Ontario (the capacity factor is 13-14%), and set the solar capacity level to 2600MW. The graphs based on this data are projections of 2016 if all goes as planned. I now differentiate demand from load - with load being demand less wind and solar. The base load is a lot more base with wind and solar in the mix! The average is about 3000MW lower, and 7000-7500MW is probably a better estimate of what base load remains. With 2000-2500MW of hydro, and another 1000 of gas, the available room for baseload nuclear would only be 4000MW even if we assume no more load following generation would be required on the grid. The renewables target certainly devalues Ontario's investments in nuclear capacity - and it is likely to increasingly devalue Ontario's public hydro assets as they are enslaved to balancing privately owned renewables. But this doesn't mean we can do without the capacity that nuclear is providing. The 10700MW of renewable supply only drops the annual peak load by 1400MW. Note there are many days in this graph where the daily peak load is less than the daily minimum, base, load from 2005. The graph demonstrates we do essentially need today's generation capacity, in addition to whatever renewables are added. The difference between the two preceding graphs emphasizes the need for flexible generation. 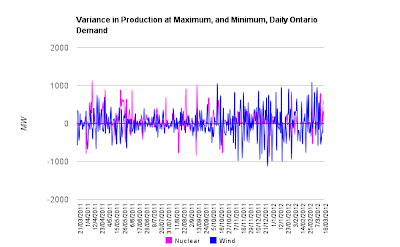 Recall that Ontario's hydro, and gas-fired, generation rarely varies over 5000MW presently, and hasn't hit 7000MW, while by 2015, if all goes according to plan, we'll need 9000MW variances on a regular basis, with a maximum daily load variance of over 11000MW. These things are known - although I'm not convinced the math had been done. The Independent Electricity System Operator (IESO) is busy developing a scheme paying renewable generators not to generate. That essentially pays them to inflate the load (as the production isn't subtracted from demand), in order for existing baseload to continue functioning. The Ontario Society of Professional Engineers is encouraging that initiative and urging more money be spent on making nuclear more flexible. Nobody seems to be able to get the government to accept the obvious. It's a lousy supply mix - and they are making it increasingly worse. As always, you impress me with your analysis. My simple take on this is that "we" are adding huge amounts of volatility and randomness to the supply side as we make other changes to our mix (phasing out coal) that will leave us much less equipped to deal with the new dynamics. Combine that with the new contract structures and we're gonna pay for it. I am looking forward to your next post, I'll try to get the grasp of it! prior to and you're simply extremely excellent. I actually like what you have obtained here, really like what you're saying and the way in which you assert it. You're making it entertaining and you continue to take care of to stay it wise. I can not wait to read much more from you. That is really a terrific web site. Quality articles is the main to attract the users to pay a visit the web site, that's what this website is providing. Anyways, I'm certainly delighted I found it and I'll be book-marking it and checking back frequently! market nowadaуs. If you feel it's time to" step on the gas" and start adding supplements, make sure that the pure green coffee bean extract may not promote this benefit in the absence of exercise. to me. Nonetheless, I'm certainly happy I found it and I'll be bookmarking it and checking back regularly! You're so cool! I do not suppose I have read through a single thing like this before. So nice to discover another person with a few genuine thoughts on this subject matter. Seriously.. thank you for starting this up. This web site is one thing that is needed on the web, someone with a little originality! many choices out there that I'm totally confused .. Any tips? Thanks a lot!